Jerald Gillens-Butler brings the ball down the court during a December game. Gillens-Butler announced on Monday he will transfer from Butler at the end of the semester. Jimmy Lafakis/Collegian file photo. 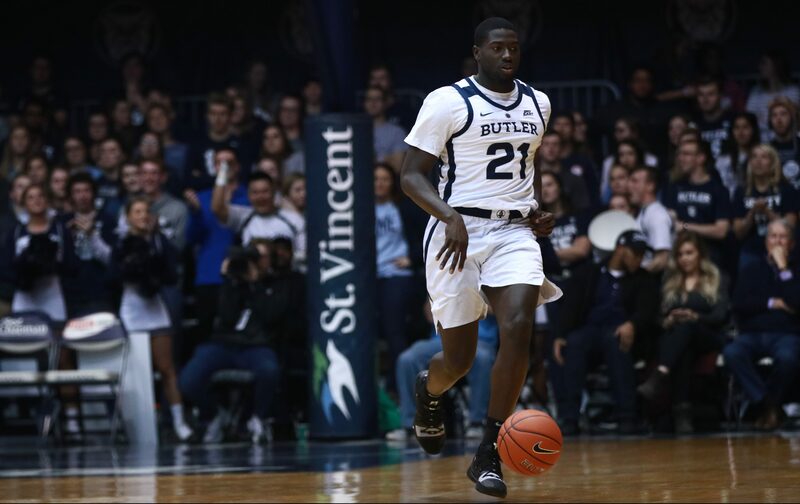 Butler men’s basketball sophomore Jerald Gillens-Butler announced on Twitter Monday afternoon that he will transfer from the university at the end of the semester. Gillens-Butler becomes the second Butler player to announce his departure from the program in the last week, following the news that Joey Brunk will leave the university in May as a graduate transfer. Gillens-Butler appeared in 11 games for the Bulldogs this season, averaging roughly six minutes and one point per game. The 6-foot-4-inch guard/forward did not appear in any Big East contests, and he did not play in any games after breaking a bone in his left hand during a practice in early February. In his two seasons at Butler, Gillens-Butler averaged 1.1 points, 0.9 rebounds, and 5.6 minutes per game. As as high schooler, Gillens-Butler was rated as a four-star prospect by ESPN. He averaged 14.5 points per game as a senior, leading his team to the 2017 Florida Class 5A state title.